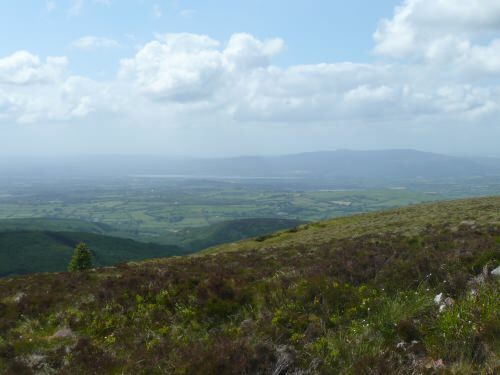 The Slieve Felim Way provides walkers with a series of stunning views from different mountains along the route. The total aggregate ascent over the route is less than 900m, and there are no significant climbs. Commencing with the Slieve Felim range to the south, valleys and hills run east-west in the general area. The 2,279 ft (694m)-high Keeper Hill – the highest mountain in the Shannon Region –comes into view as you move northwards through the Mauher Slieve Hills, which predominately lie to the east of the walk. The northern section is dominated by the renowned Silvermines Mountains and presents stunning views of Lough Derg and beyond. From different vantage points along the way, views of 4 counties are possible – Tipperary, Limerick , Clare, and Offaly – and you can also see sections of the lordly River Shannon as it winds its way to the sea. Although the trail is signposted in either direction, it is generally agreed that the starting point from Murroe and walking towards Silvermines offers the most rewarding experience. The village of Murroe, in County Limerick, is approximately 16km from Limerick City on the R506 route. A detailed map board is located at the start point in the centre of the village. Toor Village is located a distance of 6.5km north from Tooreenbrien Bridge off the R503. At Toor Village, turn right and travel almost 1km along the public roadway to the handball alley, and turn left onto the trail again. Silvermines is located on the R499, off the M7 from Limerick to Nenagh, where the Slieve Felim Way finishes at the car park near the Church.